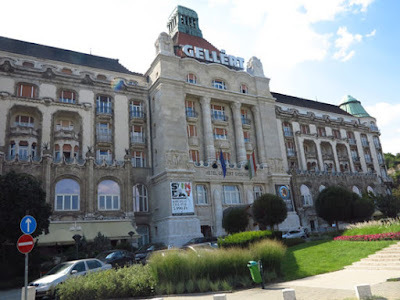 GOING ON ADVENTURES: See why Budapest is the "City of Baths"
The main indoor pool at Gellert Bath and Spa in Budapest, Hungary. Stepping into the warm, swirling water of Gellert Bath, my muscles immediately began to relax, and a soothing aura surrounded me. 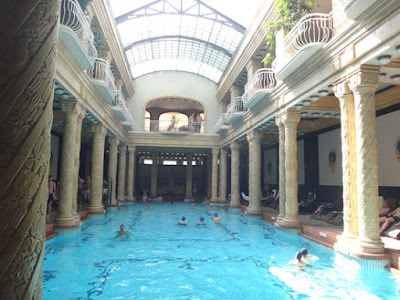 Was it really therapeutic or just my imagination from hearing so much about the healing effects of mineral hot springs in Budapest, Hungary? No matter, the thermal pool into which I immersed my body felt heavenly. scenic Gellert Hill in Budapest. Whether or not the calcium, magnesium, hydrocarbonate, alkalis, chloride, sulfate, and fluoride (yes, all those minerals are in the thermal pool waters) actually alleviate aching joints, improve circulation, or cure a variety of ailments doesn’t matter to most people visiting the thermal springs today. The baths have become a social gathering place for fun and entertainment as well as relaxation and healing. that roll though this pool. Celtic tribes, the first settlers in the area, discovered and used the healing waters in the first century B.C. Romans and Hungarians followed and used the baths for centuries. The Turks were the first to recognize the importance of Budapest’s thermal springs and turn them into bathhouses. While it’s still possible to experience traditional Turkish baths in Budapest, Gellert and Szechenyi, the two largest and best known public baths, have been modernized for today’s clients. I was able to experience both of these during my August visit to Budapest. 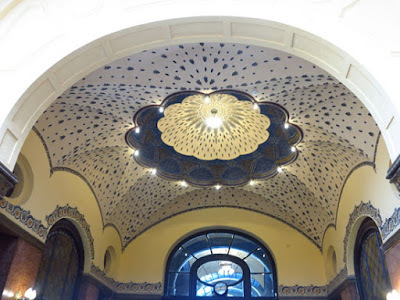 Lavish decorations inside Gellert Bath. Spring-fed Szecheny Bath is located in Budapest City Park. The spring waters of Szechenyi Baths were discovered in the 1880s, and by 1913 millions of people were immersing themselves in the therapeutic powers of the baths. 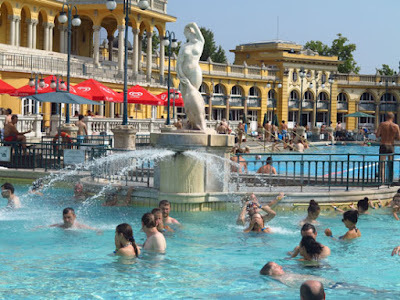 Szechenyi is a huge public coed bath located in City Park, the largest green space in Budapest. 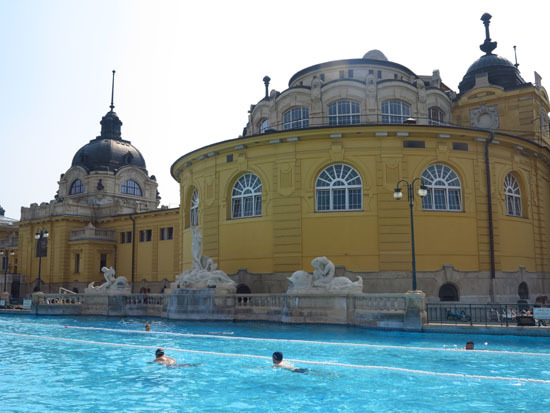 The Neo-baroque palace was specifically built for hosting Szechenyi Baths, which includes a total of 18 indoor and outdoor pools, some fed by hot springs and others featuring cooler temperatures. Ten saunas and steam baths are also available for guests, as are aroma therapy massages and other spa services. Buildings surrounding Szechney Baths are also ornate. Both complexes are built around huge palaces and include a maze of pools to explore, so plan to spend at least half a day sampling the different areas. It’s easy to get lost in the long corridors of lockers and changing facilities on multiple levels (don’t rely on the map you’re handed), so don’t hesitate to ask for directions when trying to find where you stashed your belongings. Bathers enjoy the warm, therapeutic waters indoors year round. Bring towels, flip-flops, and a swim cap if you fancy a swim indoors, as caps are required in the swimming pool but not in the lounging pools. Rentals are available as are modest food and drink options. Since the baths feature both indoor and outdoor facilities, they’re able to operate year round. If you're into wellness and spas, don’t miss this iconic experience when visiting Budapest.